About three years ago, my husband and I decided to pack all of our belongings, sell everything that didn’t fit into our truck, and head to Nashville for a fresh start with our four-year-old daughter. We had been stuck in a pit of darkness for so long that we could no longer see the light. I had been suffering SO badly with depression and anxiety that I never thought my life would get better, so a change was not only what we felt God wanted for our family, but what we felt was desperately needed for my mental health. Being a Christian mother, depression felt like a very taboo thing. I had a loving husband, a healthy kid and a relationship with Jesus Christ, so why do I feel depressed? I was told that I wasn’t praying enough; I wasn’t trusting enough. I was told many, many things that made me feel that I was less than and that I was absolutely unworthy. I started to doubt my value as a mother, a wife and a daughter of the King. I ached for some clarity and stability in my life that I wasn’t able to find on my own. I remember one morning locking myself in the closet and crying that ugly cry; thinking that my life is worth more than my feelings. I didn’t want my life to be full of fear, full of sadness and wondering where I belonged. I wanted more and needed more in my life. Now, let me preface this all by saying that mental health has a lot of factors and I am not a doctor or therapist. My best piece of advice is to seek professionals to help you work through what you are going through. But how do you light the fire within your soul when you can’t even find a match? How do you step outside of the darkness? As a mom, you know that the days are long, the nights are longer, and the emotional toll it takes on your body is unreal. But there is hope in Jesus and there is hope in community. I tried it all and the BEST thing that I found to help light that match in my soul were other women who would hold it with me. I took a chance and signed up for MOPS, hoping to find some hope for my aching soul and some sense of belonging. I poured my heart out. I attended the meetings. I shared my story, my fears, my depression, my darkness, my everything. I bore it all and took a chance on a group of God-loving women, and truly realized that love really is the catapult that can jumpstart your journey. I realized that the more I shared my story, the more I realized that there were SO many of us on the same journey. Sometimes it takes others being the hands and feet of Jesus for you to truly see your worth and value through their eyes. You are a good mother despite your feelings. There is beauty all around you. There is a light in you that is DYING to come out. Once I realized that I wasn’t alone on this journey, I could surrender daringly. I surrendered all of my fears and realized that God and my mom friends had me, and it was going to be OK. I could breathe freely knowing that I was exactly where I was meant to be. I could begin to live expectantly by knowing that good things were ahead and that this was NOT the end of my story. Today, I have two best friends who are like sisters to me. They have shouldered my pain and have shown me that I am worthy and that God will use this journey for good. I still have my days, but now they are just bad days not bad years. I have a community of mothers who pour into me and surround each other whenever a need arises. None of that would be possible without MOPS. It is not always easy to remember, but you and I are meant for more. And it is true what they say, “Small things do matter.” Creating those friendships matter and will help get you through some of your darkest days. They did for me. Fallon Poston is a stay at home mom who calls Nashville, Tennessee home where she lives with her husband and two daughters. 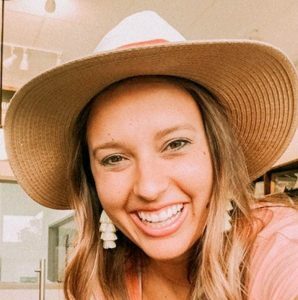 She is a mom with a mission and loves all things llamas, sushi, Crocs, Jesus and fitness (not necessarily in that order). Her life goals are being real and honest with her imperfections and struggles as well as empowering other women and moms to love themselves and Jesus. You can find her for real @fitwithfallon and www.beautycounter.com/fallonposton on Instagram.